Prognosticating About Politicians: Whatever Happened to Ron Paul? I’ve been thinking about doing a Celtic cross spread about a celebrity, and since I haven’t been following the presidential campaign, decided to try doing a spread to answer my question: Whatever happened to Ron Paul? Is he even still in the race? What’s going on with him? Just a quick, nutshell reading this time. 1. Ron Paul himself: The Hermit. That doesn’t look good for a political candidate. Looks like he’s going it alone, out wandering as a solitary voice in the wilderness. 2. Obstacles/challenges (his “cross”): Five of Pentacles. He’s short of political capital — and very likely running low on literal capital as well. 3. Strength: reversed Knight of Wands. Caution. He’s not in a big hurry, and he likes to think decisions through before making them. 4. Recent past: Four of Wands. A celebration. Did someone in Paul’s family get married or have a baby? Or does this card refer to a recent, but likely small, political victory, such as Paul getting his “audit the Fed” bill to go before the House of Representatives for a vote? 5. Near future: reversed King of Pentacles. This card is likely about the question of whether or not to support Romney. Paul will be sorely tempted to do whatever it takes to win more support — including betraying his own integrity. Will he give in to this temptation? Maybe. But I think the temptation will be more fleeting. Candidates who have a committed core of supporters with extremist views tend to be loyal to those supporters. In the end, I don’t see Paul selling those supporters out just to become more mainstream — and I don’t think it would work if he did. 6. Crowning card or best possible outcome: Knight of Swords. Paul can’t become President (at least not in this race) but he could influence the debate by pushing the candidates hard and by using his metaphorical sword to cut through lies, deceit, and b.s. (or what he views as lies, deceit and b.s. — others may not agree, but this reading is meant to focus on Paul’s own perspective). 7. 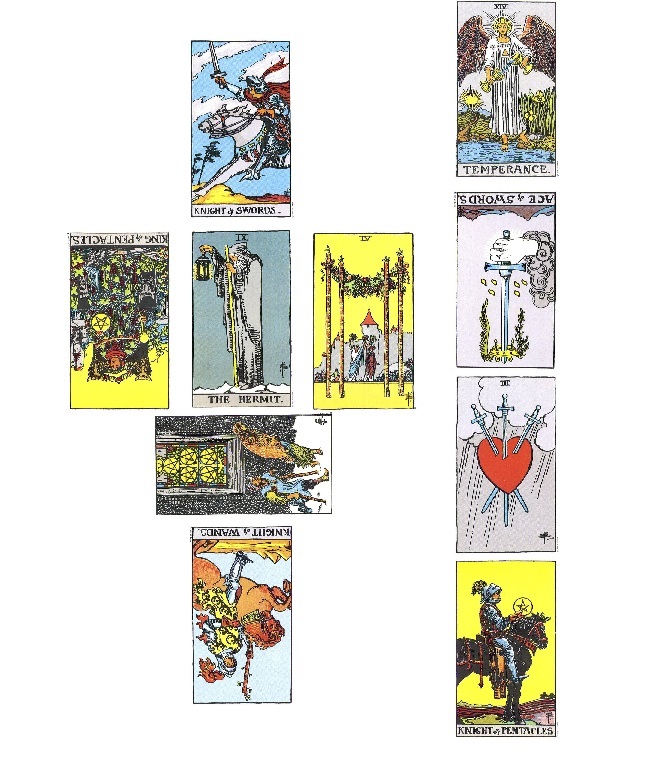 Paul’s own current attitude: Knight of Pentacles. He’s out looking for more political capital, stumping for it, but his horse is at a standstill and he knows it. 8. Environmental influences/support network/etc. : Three of Swords. This race is breaking Paul’s heart. Has there been a betrayal of a political alliance somewhere along the way? 9. Paul’s hopes/fears: reversed Ace of Swords. Fear that he won’t get to speak his truth — possibly at the Republican National Convention. 10. Final outcome (of this race, for Paul): Temperance. He’ll have to find balance — a balanced role in politics, a road to more support from political centrists, a way to seem less extreme to voters. His future political capital may depend on this ability to be viewed as moderate and in balance — and I predict he’ll manage to find that middle of the road path that he’s looking for, though some may doubt his sincerity in seeking it for political reasons. Overall: Does Paul have a role to play in this campaign? Yes. But his part will be influencing the debate, possibly as a political gadfly. This is really cool! Never seen a blog quite like this! Thank you! There are a couple of other posts about politicians in the archives, if you search…glad you liked this one! Cool post. I had been wondering what happened to Ron Paul. I wasn’t quite sure if the Republican primaries were over or if Ron Paul had just stopped promoting himself. I have to say, I wish he could have been the Republican candidate. He was the only Republican candidate who had plans to cut federal spending, deal with Iran peacefully, and diminish America’s foreign influence. I was very intrigued by him too! We’ll see what happens…thanks for the comment! This is interesting from his perspective. Of course, he’s a delusional liar, but taken from his perspective it’s fascinating. Glad you found this interesting! I enjoy doing these and always try to pick people who I don’t personally keep up with very much so that the reading can be more objective and hopefully not too affected by my own perception of the news. This is such a coincidence! I just did a Celtic Cross on Ron Paul too! You can check it out on my blog if you’re interested. Awesome job! Wow, that is a coincidence…I’ll go have a look at it. Thanks for the comment!